Afternoon visit from 3pm opening. I had an interesting journey from Haydons Road railway station as part of Haydons Road itself was cordoned off by police following a shooting incident earlier in the day. A good welcome here as usual. Early evening visit, I had been with some friends in the nearby Trafalgar and decided to walk to Haydon's Road Railway Station via here. I did not list all the beers available but there was a good range from Hop Back. I was delighted to find that I had arrived at Beer Club time which is some sort of Happy Hour and my beer was very good value at £3 per pint. Hop Back - Entire Stout 4.50 So good that I decided to have another one and catch a later train. From mid-day opening for about four hours, a splendid pub with excellent staff and pleasant customers. Hop Back - GFB (Or Gilbert's First Brew) (superseded by 3.5% version from about 2010) 3.80 Selling well, they got through an 18 yesterday and it looked as if they may do the same today. Hop Back - Fugglestone 4.00 A good traditional bitter, I stayed on this until it ran out. Easter Monday lunchtime and very welcoming, I could have happily stayed here all day. 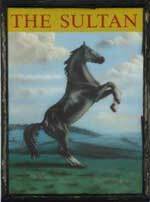 Hop Back - Fugglestone 4.00 A good traditional copper coloured beer. Afternoon visit, a superb pub with good value beers and a basic food offering. Unfortunately I had to leave just before happy hour. Hop Back - Entire Stout 4.50 Not Tried Selling well and soon ran out. Downton - Dark Delight 5.50 Not Tried This replaced the Entire when that ran out. Early to mid-evening with Terry and Albina. It was warm and we sat in the garden. Hop Back - Summer Lightning 5.00 Not at its best, we thought it might be a little ‘green’. Downton - Argento 4.00 Brewed with Argentine Cascade hops. A chestnut-coloured Bitter. In somewhat ‘green’ and flat condition. Evening visit, latish thus finding only the stalwart few left of our Friday evening group. Seemed perverse to me that the pub had just been awarded the local CAMRA branch Pub of Year but called the 2016 award. Very welcoming and comfortable pub. A group of us met here for one of our regular Friday evening gatherings. Beers were good value and sandwiches available from £2.90 very good for a London pub. I was told that the brewing kit is still intact downstairs but is not currently in use. Hop Back - GFB (sometimes GB) 3.50 I am sure it said GFB on the clip. Early evening and the conversation here is more polite than at the nearby Trafalgar. Very welcoming staff. Some local CAMRA top brass in the Lounge Bar. Not a sign of any homebrew on the bar. Wimbledon - Copper Leaf 4.00 A chestnut-coloured beer in the US Red style. Very nice blend of fruitiness and hops. Downton - Coconut Milk Stout 5.00 Quite dry coconut tastes and lacking the sweetness I associate with a Milk Stout. Actually, there was some debate at the bar over whether this is a Milk Stout with coconut, or a Stout with coconut milk. 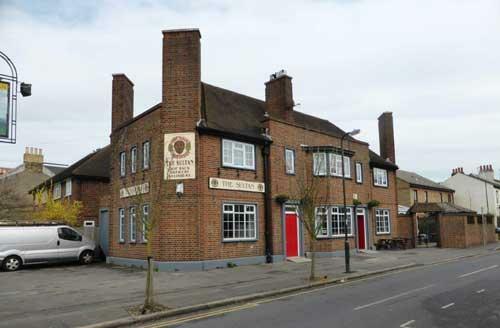 The pub is found in South Wimbledon, Greater London, SW19 1BT. 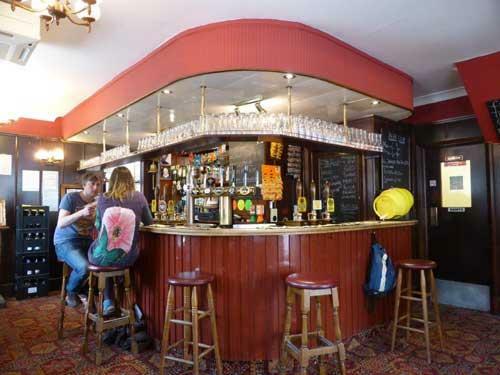 1950s pub built to replace war damage. Two bars, still with lots of original features. Front bar has 4 handpumps and rear larger bar has 6 handpumps and any one beer although pumpclipped in both bars may only be being served from one of the pumps so don't be surprised if your server disappears to the other bar. 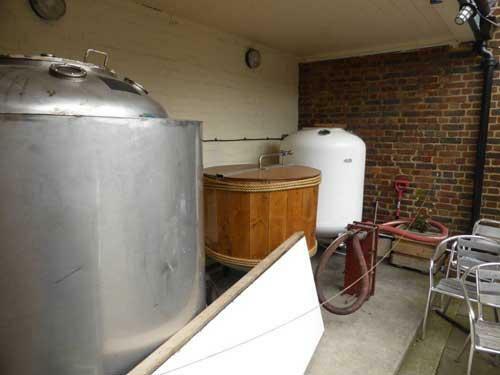 There is also a modern conservatory, and there was a micro-brewery which seemed to brew iregularly in 2015 which has now been removed. In March 2017 awarded local CAMRA branch Pub of the Year 2016. We have visited this pub 12 times, seen 24 different beers and tried 12 of them.